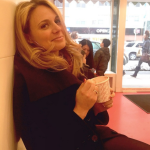 It was three summers ago that I found myself squeezed in the James Corbett Salon in New York for a green beauty event. 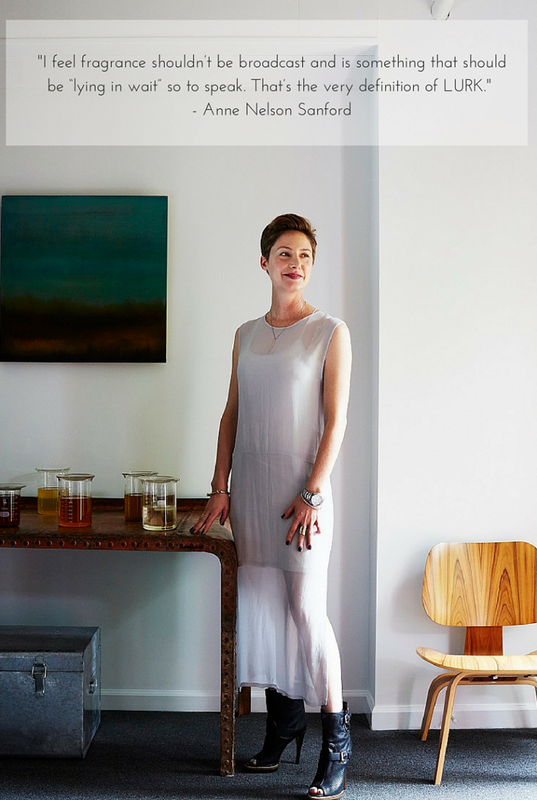 One of the many lovely women I met that night was creative soul and perfumer Anne Nelson Sanford. 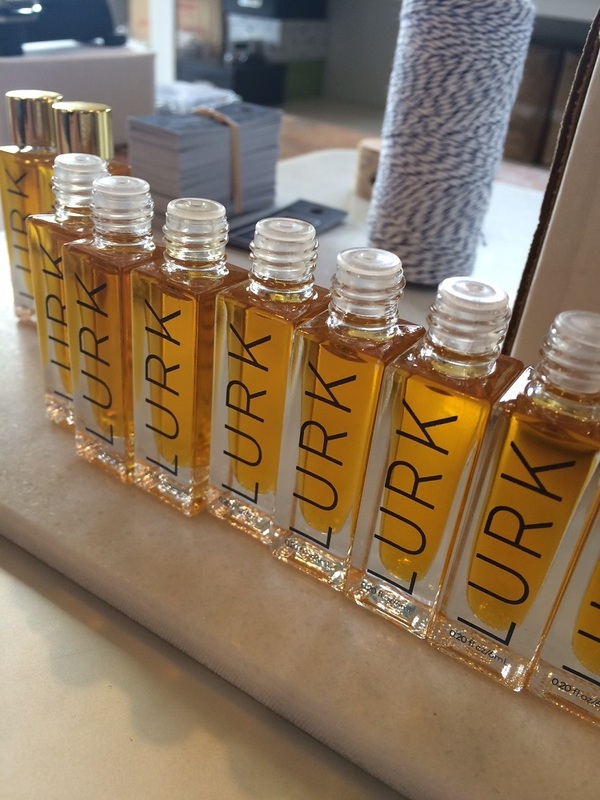 She was cheerfully introducing everyone to LURK, her line of perfume oils that she blends and pours by hand. I was immediately drawn to the beautiful petite glass bottles with gold ball-shaped caps. I took notice of how lavish, intricate and unique the scents were. 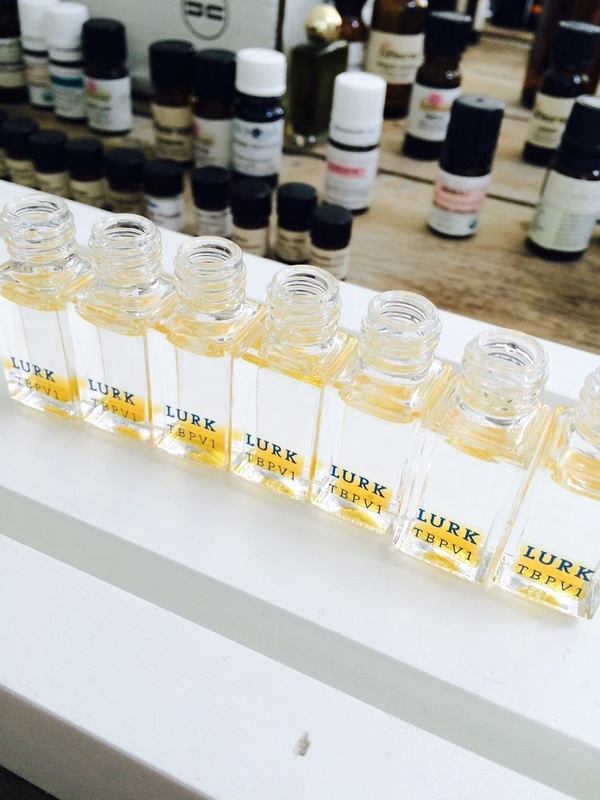 I loved that LURK was so feminine in appearance but not necessarily in smell. Anne continues to push the boundaries of fragrance. 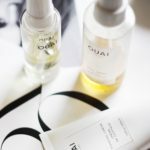 Her newest perfume, LURK OM 011 uses oudh oil distilled from an evergreen that grows in south Asia. It’s said to be aphrodisiac and can deeply affect emotions (bow chicka wow wow!) 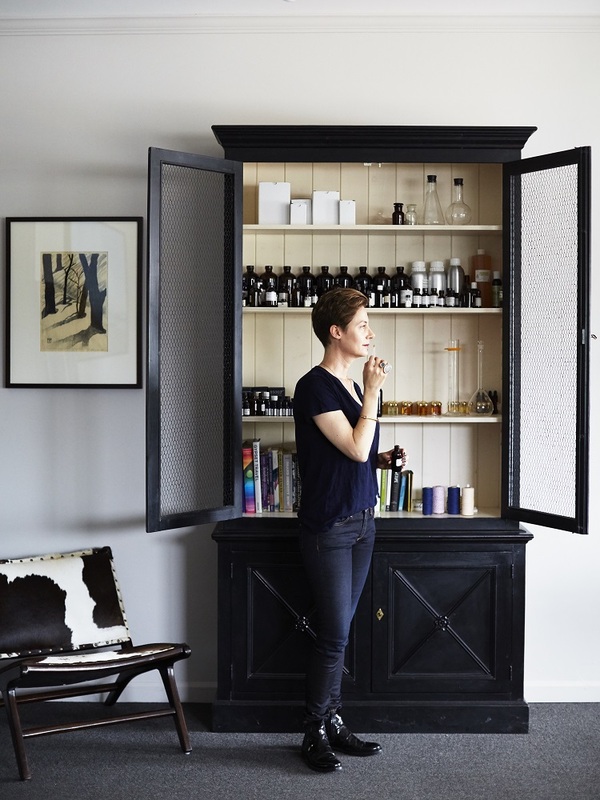 I’m always so curious to know how a perfumer thinks about scent so I asked Anne to tell us some stories. 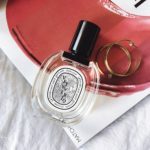 Naturally, she describes the connection and feelings tied to fragrance in a way that completely moved me. She also shared a pretty awesome foundation tip that I am going to try immediately. And, we should probably collectively admire Anne’s stellar shoe game. Have you always had a curious sense of smell? Yes, absolutely, I would also say that I also have a very acute sense of smell and that created a lot of curiosity for me at a young age. Early on I was profoundly impacted/moved by scent and very drawn to the evocative nature of fragrance. Scent obviously drives my creativity in almost every way and I am endlessly inspired by it. It doesn’t have to be classically beautiful, the odd or curious really opens up so much for me and that olfactory sense is incredibly primal. I think I am just incredibly reactive to it and I allow it to permeate my thought process. Scent is powerful and evocative, of all of our senses it is the most primal and I am very tuned in to that. Our sense of smell is also very tied in to our emotions and how we feel about those around us. What are your strongest scent memories? My strongest scent memories are of my grandmother and her beach house as well as of my mother’s closet. All of the incredible smells of the ocean, the surrounding plants and citrus trees always remind me of family and of love and of those that have passed away. It’s really beautiful. I also used to spend hours playing with my mother’s makeup, fragrances and clothes. We are polar opposites but I am incredibly inspired by her. Her style, her look, image, etc. All of those things play into emotion and our relationship and scent is a huge part of that. What is the significance and meaning of LURK? I feel fragrance shouldn’t be broadcast and is something that should be “lying in wait” so to speak. That’s the very definition of LURK. Definitely not in a menacing way, it’s something unexpected that one finds or experiences as they get to know another person. Scent is intimate, powerful and evocative and is part of the journey we go on in life, getting to know people and experiencing our surroundings. I also have a pretty off center and slightly dark sense of humor so I find the nature of the word LURK to be funny and a bit entertaining. Scent creeps and that doesn’t have to be a bad thing. It can also ambush us for sure. I mean this in a way that is fun, hilarious, sensual etc. Like when you have a crush on someone and you get close enough to experience how they smell and then you’re hooked, in love, can’t get enough or… the complete opposite. We attach so much emotion to scent in a way that we are not always conscious of, scent is evocative of feelings, memories, etc., and that is always lurking around in our subconscious, our memories and hearts. We remember what our friends smell like, our grandmothers, lovers etc. and when we catch a fragrance in the breeze we can instantaneously be reminded that person or of a specific time in our lives. I love that aspect of scent and fragrance. It’s always lying in wait to bring us joy, passion, comfort, sadness etc. There is so much stored up in those experiences of scent, it’s really beautiful and powerful and it definitely LURKs. When it’s reactive. What I mean by that is when the fragrance starts to create deeper reactions in whoever is wearing it. When we can’t stop smelling the fragrance because we want to see where it’s going to go next. When it really starts to move beyond the point of smelling good and starts to travel and become evocative, reactive and exciting. That complexity and living nature of a perfume is when I decide it’s complete. What makeup do you wear on a daily basis? I go back and forth between RMS and W3LL People. I absolutely love both brands and my go to products are RMS “Un” Cover-up in 33 and 22, Lip2Cheek in Smile and Eye Polish in Solar. I also love to mix W3LL People Altruist Foundation Powder with Laurel Whole Plant Organics Balance Facial Serum to create a super moisturizing liquid foundation (the results are amazing). I also love W3LL People Universalist 1 for cheeks/lips. How often do you switch up your perfume? Constantly, I absolutely love perfume so I am always trying something new. I love wearing fragrances by other perfumers as well (especially if I know the person). 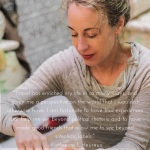 To me – and I think most perfumers – fragrance is art so having the opportunity to experience beautiful creations is a gift and it adds so much to each and every experience. The million dollar question: where should we be applying perfume on the body? Why? Be sure to apply your perfume to “hot spots” or areas of the body that are the warmest. Don’t limit application to just the inside of the wrists and the neck, apply to the small of the back, the belly, the back of the neck, the back of the knees and the ankles. 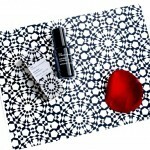 Areas that are warmest help to transmit the scent very gently and in a very intimate way. When we move or are close to someone our natural body heat will allow the scent to be perceptible.